Chronic and recurring skin conditions can affect patients of all ages. Ranging from mild to acute, they can cause physical discomfort and emotional distress. Natural health practitioner Dr. Bret Mosher is an expert provider of complementary medicine for skin conditions. Practicing in Poway, CA, Dr. Mosher is nationally recognized for his expertise in traditional Chinese medicine. Skin disorders have been treated for centuries in China using this 5,000-year-old body of knowledge. 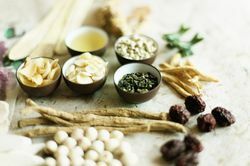 Traditional Chinese medicine can provide longer lasting relief for skin conditions than conventional Western medicine, and it can alleviate related conditions as well. If you are seeking complementary and alternative (CAM) approaches to a skin condition, contact our practice to schedule a personal consultation with Dr. Mosher. Within the domain of traditional Chinese medicine, dermatology is a recognized specialty. The human body is a constellation of energetic forces called qi, which flow in patterns of channels called meridians. This energy flow occurs in all tissues and substances in the body, and controls all its functional activity. When qi becomes interrupted by pathology, it becomes blocked in certain areas and deficient in others. The two main sources of skin problems are “heat” and “dampness.” The cause of “heat” is distress in the body, which can arise from overextending oneself or from emotions such as anger. It is also related to over-activated hormones. The cause of “dampness” is the insufficient flushing of toxins and waste. It is also associated with a moist or humid environment and water retention. Dr. Mosher can provide effective, long-lasting treatments for almost every skin condition, including psoriasis, dermatitis, alopecia, rosacea, eczema, acne, and more. Eczema, for example, is considered to be an excess of “wind heat” (corresponding with chronic eczema) or “damp heat” (corresponding with acute eczema). Acupuncture relieves the congested qi to restore its flow along the meridians. Chinese herbs correct internal imbalances to encourage self-healing, as opposed to treating symptoms alone. Dr. Mosher also draws on his vast knowledge of nutritional counseling in the treatment of skin disorders. For example, omega-3 fatty acids have been found to improve psoriasis, and a gluten-free diet has also been shown to benefit some patients with the condition. At Mosher Health, we use advanced technology to determine your diagnosis, including Acugraph digital meridian imaging, bioimpedance analysis, cholesterol and hemoglobin A1c tests, and food allergy tests. By expanding your diagnosis beyond the obvious symptoms, Dr. Mosher can provide effective, long-lasting treatments for almost every skin condition, including psoriasis, dermatitis, alopecia, rosacea, eczema, acne, and more. He often alleviates related conditions at the same time. For example, psoriasis and certain other skin conditions are associated with autoimmune disorders, and both can be treated using a functional approach. In children, eczema is associated with asthma. Modified versions of acupuncture have been very successful in treating children’s eczema, and have also been shown to alleviate asthma. The importance of seeking a qualified provider of complementary and alternative treatment for skin conditions cannot be over-emphasized. In the United States, herbal products are not required to meet any standards for active ingredients, purity, or concentration. There are also no regulations that state which herbs can be marketed for specific indications. As a licensed and trained natural medicine provider, Dr. Mosher can guide you to healing modalities that are both safe and effective. Dr. Mosher’s goal is not only to bring relief for your symptoms, but to guide you to overall health and wellness for a lifetime. To learn more, please contact us and schedule a personal consultation. "Each time I see you I feel better than the time before. Never has seeing a health-care practitioner been so beneficial in such a relatively short time....Thank-you"
"I am very thankful to have been led to your healing ways. Because of you I am able to maintain a sense of consistency in this stress filled existence of mine."